Even in the absence of external forcing, climate models often exhibit long-term trends that cannot be attributed to natural variability. 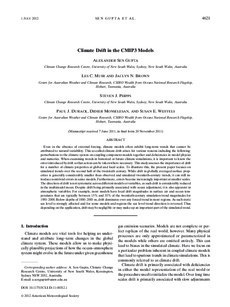 This so-called climate drift arises for various reasons including the following: perturbations to the climate system on coupling component models together and deficiencies in model physics and numerics. When examining trends in historical or future climate simulations, it is important to know the error introduced by drift so that action can be taken where necessary. This study assesses the importance of drift for a number of climate properties at global and local scales. To illustrate this, the present paper focuses on simulated trends over the second half of the twentieth century. While drift in globally averaged surface properties is generally considerably smaller than observed and simulated twentieth-century trends, it can still introduce nontrivial errors in some models. Furthermore, errors become increasingly important at smaller scales. The direction of drift is not systematic across different models or variables, as such drift is considerably reduced in the multimodel mean. Despite drift being primarily associated with ocean adjustment, it is also apparent in atmospheric variables. For example, most models have local drift magnitudes in surface air and ocean temperatures that are typically between 15% and 35% of the twentieth-century simulation trend magnitudes for 1950�00. Below depths of 1000�00 m, drift dominates over any forced trend inmost regions. As such steric sea level is strongly affected and for some models and regions the sea level trend direction is reversed. Thus depending on the application, drift may be negligible or may make up an important part of the simulated trend.